I recently signed up as a member to the SEAMWORK website and as part of the promotion was entitled to 2 free patterns. SEAMWORK PATTERNS GRETTA (3057) shoulder tie tank top looks lovely as it is, but how much better with a skirt so that it is a Sun Dress? With a relaxed fit and adjustable shoulder ties, Gretta’s silhouette can be as comfortable as you prefer. Darts provide shaping for the bodice, while a rounded patch pocket adds a bit of charm. The shoulder strap is sewn onto the front and back bodice to help with cutting layouts and fabric waste. A facing finishes the armholes, neckline, and ties, all at the same time, and the low scoop neckline is flattering yet modest. I printed off the PDF pattern and cut to a size 18. 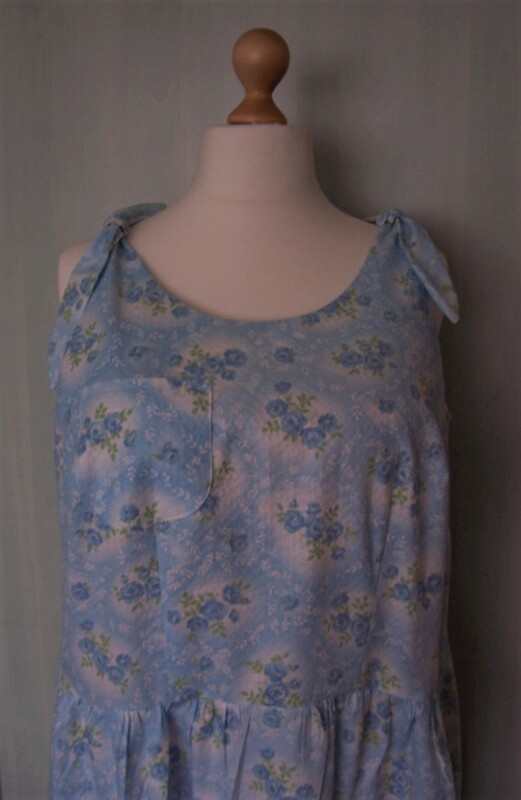 Using some gifted fabric – a pretty Light Blue floral-printed seersucker, I started to make a ‘wearable muslin’ or toile. 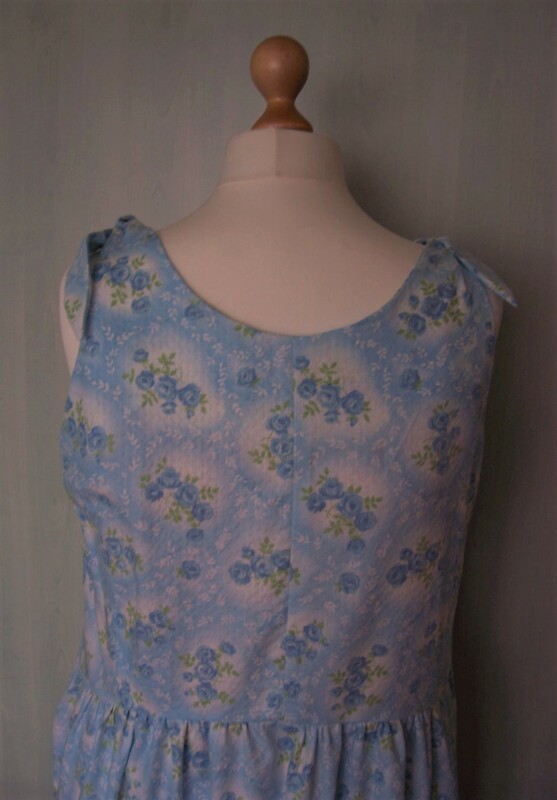 As the original pattern was a loose fit, I added darts from the waist towards the shoulders at both front and back. I also raised the bust dart by 1 “. I found the waistline, added a seam allowance and cut off the pattern front and back at that point. I knew that come the fitting stage I would need to contour the waistline but at least this was a starting point. I cut the remainder of the gifted fabric in half to make two panels for the gathered skirt. I hemmed at 26” length which turns out to be a little on the long side – next time I will reduce the length. The other thing that I notice is that I should have pattern-matched the centre back seam or cut on the fold (Ooops!). With a couple of sessions of stitch, fit, adjust, cut, stitch and fit I have finally completed the dress. There are a few further adjustments needed (e.g. 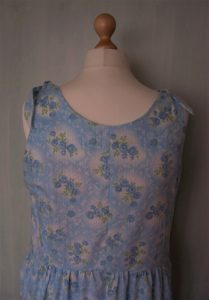 take in more at the side seams) but for now this dress will be fine for those (very rare) days when we have a heat wave!